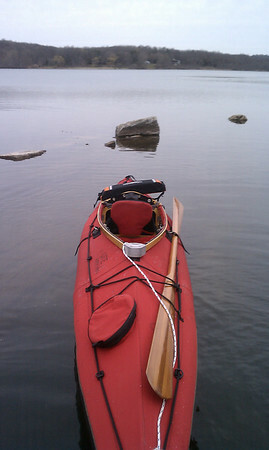 Folding Kayaks Forum • View topic - Greenland Paddles w/ Folding boats? Greenland Paddles w/ Folding boats? Post subject: Greenland Paddles w/ Folding boats? I was just wondering what folks thought of the Greenland paddles? I am just getting into kayaking and have a Euro-style paddle. But I am very impressed and intrigued by the GP. The wooden paddles are beautiful and a two piece paddle appears very compact. I have read some folks say the GPs are easier on the shoulders. And the folks who are proficient with them in youtube videos look like they go just as well as the Euro. Thoughts? Post subject: Re: Greenland Paddles w/ Folding boats? I prefer Greenland style paddles, even with my wider boats. I have a Feathercraft Klatwa, and a pair of the Werner Arctic Wind paddles. GP is better for your body. Easier on joints. Wood... I don't like wood as a material, it's soft, quickly wears out. There are composite GP too, they cost a bit more. Same fast as Euro?... Hm... perhaps only in hands of those tough dudes in YouTube. May be you will eventually reach same efficiency or may be not. Expect not to, as this is the fate for most of us mortals. One more thing - Mike said "...even with wider boats", and he is right. Because GP doesn't work well with wider boats - it works, just not well. Hands come closer to water, and those high coamings on "wider boats" (read "Folbot or Klepper") can rub annoyingly against your skin. But this is merely a discomfort - real drawback is that GP is less efficient with wider boats. The definition of "wider"... Let's say from 28" Klepper and up. But those high coamings add a bit of pain too. (Have just noticed that the OP is future Cooper owner - no problems here, go for GP). PS: Yet one more thing - GP is wetter on hands. Get some semi-dry gloves if you're not in Florida. You could of course get a longer GP, for my Aerius 2 i use the longest Nautiraid Eskimo and like it. Wood... I don't like wood as a material, it's soft, quickly wears out. There are composite GP too, they cost a bit more. If you like colour (as I do) this man: http://novorca.com/ makes carbon Greenland paddles which are beautiful enough just to hang on the wall and admire. But I'm fairly sure he doesn't make 2-part paddles, which reduces their usefulness for folding kayaks. I've never used a GP. Would be interested to try one, but not to buy without trying. John, that looks more like an Aleut paddle. Maybe it's just the angle of the photo though. I paddle my 21" beam Romany exclusively with an 88" greenland paddle. I love it so much I sold my two carbon fiber Werner Ikelos paddles because I lost all my euro blade skills and could not paddle with them any more. I also have a bombproof roll with my greenland stick and can do most steering strokes better. I have been looking at Aleut paddles for the wider folders. I am thinking 94"-96" for a 28" beam. Randy, yes i think it is, i have a beatifull Greenland paddle for my Triak that was made by Jill Ellis of ADANAC PADDLES whose work is absoulutly top notch, she made it to the length i wanted and gave me all the instructions on how to care for it. If a really hard "tip" is wanted she uses a very hard piece of wood for this, check out her web site. If anyone wants a "take apart" Greenland there is a maker in Thunderbay who makes one, i will have to look up his name. Yes, this one on photo looks like longer shaft and shorter blades than GP normally have. I wouldn't be able to place drip-rings on my Klatwa Greenland Paddle because this is where my grip is - with thumb at the root of the blade and other 4 fingers on the blade. And even if I could, they wouldn't help as my palms would've been beyond the rings. I found a 230cm GP on sale last winter and absolutely love using it on both my Aerius II and my Ute. It may be a bit long for the Ute but I still like it better than the Werner Camanos I bought three months before. Mine is a little longer than most with a slightly wider blade. It has an epoxy finish which has gotten marred much quicker than I would have ever expected - so I wouldn't bother with that again if it was an option. I love wood and I really love every aspect of the paddle, except maybe for the excessive wetness it brings into the boat and onto your lap. I plan on making my own one of these days. There are quite a few workshops around and a few 'do it yourself' sites on the web as well. D, you better do that epoxy thing. I paint the tips of the blades with epoxy every season (and fill some dings too), as the tips have the most wear. I'm also a "convert" to the GP. I had a laminated 84" shoulderless rounded blade GP made (by Friday Harbor Paddles of Washington) to use with my replica Greenland wood and nylon skin-on-frame hunting kayak. I enjoyed it so much I began to use it all the time with my Feathercraft Kahuna and now with the FC Wisper that replaced the Kahuna. Plus I carry a 72" Greenland "storm" paddle for my spare. The only time I use a "Euro" paddle anymore is a fairly narrow bladed old Voyageur when paddling shallow rocky creeks with my plastic kayak, otherwise I will just lend my Werners and the Voyageur to friends I share my other kayaks with. I plan to treat myself to a Northern Light 3-piece carbon GP later this year so that I can carry it on a plane with the Wisper -- these are very cool in that you can assemble the two paddle ends without the middle ferrule section to create a storm-sized paddle for sliding stroke. 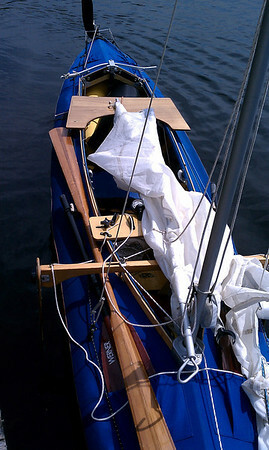 Northern Light also makes a sectional Aleut style paddle up to 90 inches (230 cm) that would work with some wider boats. I feel spoiled by the GP -- people often ask to borrow it to try out and I find myself fidgeting until I get it back. No matter how nice of a standard paddle they trade with me I never like it and want my "stick" back ASAP. The "Euros" just feel awkward and clumsy to me now. And I have become accustomed to using a higher angle stroke that draws the paddle closer along the hull -- since I have a short upper body and arms that just works better for me than any stroke with a conventional blade. To save the tips on my Nautiraid paddles i made tips from thin sheet brass.